Mike Huebsch was appointed to a six-year term at the Public Service Commission of Wisconsin by Governor Scott Walker on March 1, 2015, and confirmed by the state Senate in April 2015. Commissioner Huebsch began state service in 1995 representing western Wisconsin’s 94th Assembly District for sixteen years as a Republican in the state Legislature. He served two terms on the budget-writing Joint Finance Committee, including one as vice-chair. In the following years, he was elected by his colleagues to serve first as Assembly Majority Leader and then as Assembly Speaker. As Speaker, he led the negotiations on Wisconsin’s $60 billion budget and set the policy agenda for the state Assembly. He was also responsible for managing the budget and personnel policies of the 99 member body and more than 200 staff. 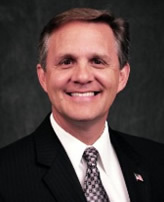 Upon his inauguration in 2011, Governor Walker appointed Commissioner Huebsch to the top cabinet position as Secretary of the Department of Administration. In addition to advising Governor Walker on state policy and operations, he managed the Governor’s cabinet agencies as well as nearly 1000 staff and $1 billion annual budget in 13 different divisions, overseeing everything from state budget and finance to the Capitol Police. Commissioner Huebsch has always approached policymaking with the knowledge that when Wisconsin leads, much of the nation follows. As he brings over 20 years of state government experience to the PSC today, he continues to believe that answers to many of the challenges facing Wisconsin and other states around the country will be found here at home. Commissioner Huebsch was born in Milwaukee and has been a resident of La Crosse County for the last 45 years. He graduated from Onalaska High School and attended Oral Roberts University in Tulsa, Oklahoma. He lives in West Salem with his wife, Valerie, and their two children, Ryan and Brett.